Day One started – as all sensible plans do – with a trip round the Forum admin & HR offices to have my passport photocopied so my contract could be set up, temporary office space designated, and relevant keys and swipe-cards procured. With all that swiftly out the way, I went to see Prof. Jon Oberlander and touch-base on the plans for the next year. Jon have and I worked on the Leverhume Trust artist-in-residence application together over the last year, and he has been an invaluable support in making this residency happen, and discussing the various shapes it could take. He’d previously taken me on a tour of the different levels of the Forum and talked about the different research institutes, so this morning we went on an exploratory visit to the labs down in the basement. The doors to the small rooms where participants in various research projects sit and listen to audio or are recorded speaking, or have their eye movements tracked – all the doors are exceptionally thick (to reduce noise interference). The rooms have small windows into them, banked by desks with computer monitors. The desk chairs have a long, clean modernist style to them. The walls are white or pale grey. The lingering impression is of a mental health asylum: these are spaces designed with the utter intention of monitoring human behaviour. Purpose-built, they have echoes (for those of us with over-fanciful imaginations) of the kind of film where someone is accidentally locked in, or trapped, or tricked, or all three. One room has special foam spikes all over the wall, creating an almost-echo-proof chamber for recording quality (only almost: no foam padding on the floor). Walking past the rooms in which the building’s servers sit, there was a perceptible buzz in the air: a static presence. Further down the corridor are rooms with large water tanks: water is channelled from the roof of the forum into these tanks, where it is then used for toilet flushing and so forth around the building. Which is pretty neat, until you start thinking ‘but, those large tanks of water are on the same level as the large & presumably essential computer servers’. One hopes both sets of rooms are suitably flood-proofed. We also did a tour of the various hot-desking areas in the forum, peered through the doors of the robotics lab (they’re currently filming ants), identified the ceiling camera (through which our movements – like the lab ants – are recorded for analysis), dropped by InSpace to say hi to Mark Daniels, and checked with Jacques Fleuriot if it would be okay for me to sit in on the inaugural meeting of the Research Committee (answer: yes). 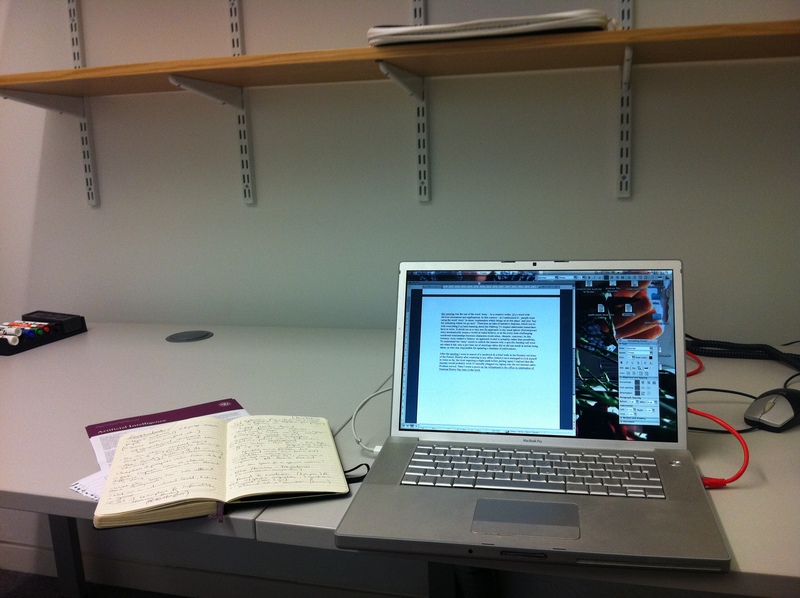 I borrowed some books from Jon, then setup home in my temporary office on Level 3. 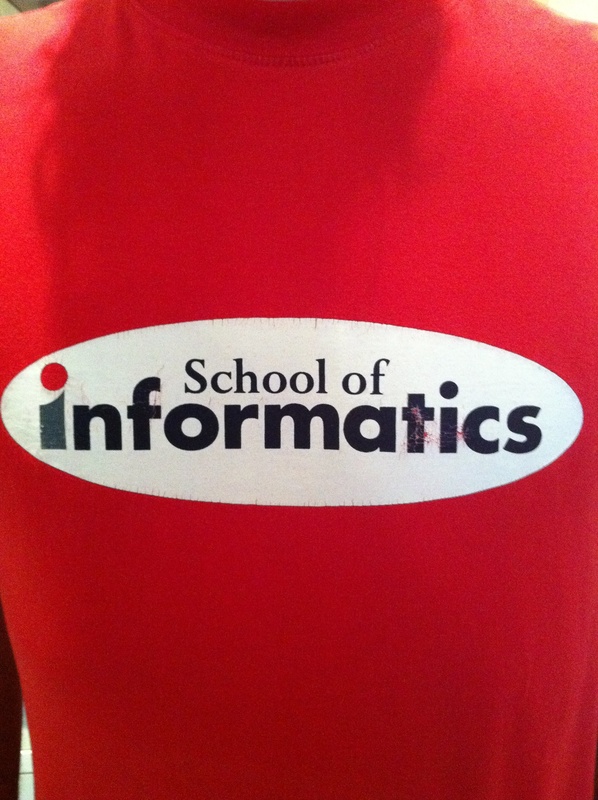 With only half an hour to go before I imposed on the Research Committee, I satisfied myself with reading through the UG & PG prospectuses for the School of Informatics and failing to establish an internet connection on my laptop (kind of embarrassing for me, considering the environment…). 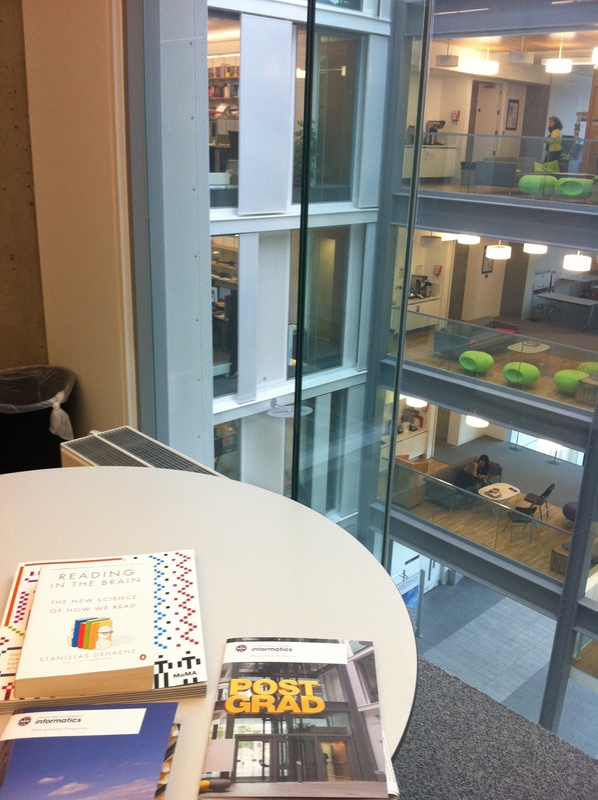 Then it was up the spiral staircase to level 5, to the Turing room, to meet the heads of the various Research Institutes. I’ve been sitting in on academic committee meetings for over a decade now: first as a student rep, and more recently as a member of staff. One thing which struck me about this meeting was the use of the word ‘story’. As a creative writer, it’s a word with obvious resonances and applications. In this context – as I understood it – people were using the word ‘story’ to mean ‘explanation which brings us to this place’ and also ‘key for unlocking where we go next’. There was an idea of narrative impetus, which ties in with everything I’ve been learning about the Pathway To Impact statements researchers have to write. It struck me as a very non-fic approach: in my usual sphere (fiction/prose) story automatically means a world of make-believe, or at the every least challenging emotional relationships between characters (motivation, obstacle, outcome). In this instance, story related to history: an approach rooted in actuality rather than possibility. To understand the ‘story’ meant to unlock the reasons why a specific funding call went out when it did, why a previous set of meetings either did or did not result in action being taken, or who was responsible for updating a database of publications. After the meeting I went in search of a sandwich & a brief walk in the blustery environs of the Forum. Shortly after returning to my office (which I have managed to lock myself in twice so far, the door requiring a slight push before pulling open) I realised that the internet would probably work if I actually plugged my laptop into the red internet cable. Problem solved. 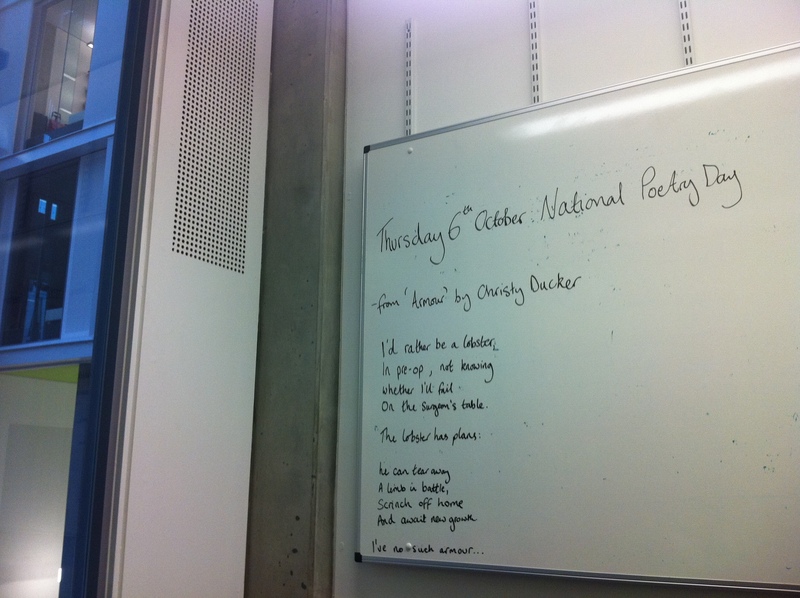 Then I wrote a poem on the whiteboard in the office in celebration of National Poetry Day later in the week, checked my emails in celebration of being able to access the internet through something other than my iPhone (yes, I’m one of those people), and went for a wander round Level 3 to try and get my bearings. The rest of the afternoon has been spent drawing up a draft proposal for masterclasses for researchers, and monitoring the weather outside. Shortly after I wrote up the poem, the quality of the light in the building changed severely as dark grey clouds rolled in over Edinburgh. Since the Forum draws in a lot of natural light through the wide vistas of glass walling, distributed in turn throughout offices such as 3.22 (me!) through an open-visualisation round the central courtyard-space, the weather has a dramatic impact on the space I’m currently sitting in. The desk faces an internal wall, so the light comes through the glass wall at the front of the building, through those various offices on that side, across the courtyard, and into the wide glass-window behind me, augmented by skylight down into the forum, and so forth. Which means I see the effect of the weather-changes before I turn round to verify the cause.